Moon blindness, a painful condition of the eye, was so named because it appeared to occur with the phases of the moon. We now know that moon blindness can occur over a period of days, weeks, months or years and has nothing to do with the moon. A diagnosis of moon blindness is painful to both the horse and owner as sometimes it's necessary to make difficult decisions to avoid prolonging the horse's continual pain. Some breeds seem to be more susceptible than others. Appaloosas, in particular, seem to develop moon blindness more commonly than other breeds. If you suspect moon blindness, call your veterinarian as a quick diagnosis is important for your horse's comfort. Like many diseases and conditions, there are many names for moon blindness. Other names for Mood Blindness are Equine Recurrent Uveitis, periodic ophthalmia, ERU, periodic ophthalmia or chronic intraocular inflammation. There are several possible causes for moon blindness or Equine Recurrent Uveitis. Bacteria, fungus, viruses, parasites, pollen, vitamin deficiencies, autoimmune deficiencies and physical injury all may be a cause of moon blindness. The leptospirosis bacteria and the bacteria that causes strangles may be two of the more common bacterial causes. Equine flu, tooth and hoof abscesses may also trigger moon blindness. If there is a parasite connection, the moon blindness may be triggered by worming medication. Moon blindness is regarded as recurrent because it appears to clear up and then spontaneously reoccurs. For some horses the recurrence may occur over a period of years or flare-ups may occur far more frequently, episodes happening within weeks or even days. Symptoms of moon blindness include inflammation and redness of the eye area, murkiness or white discoloration of the eye, tearing, squinting, and profuse but clear tearing. The horse will be reluctant to be in bright sunlight. Although it may not be evident, the horse will be feeling pain from the symptoms. ERU may affect one or both eyes. 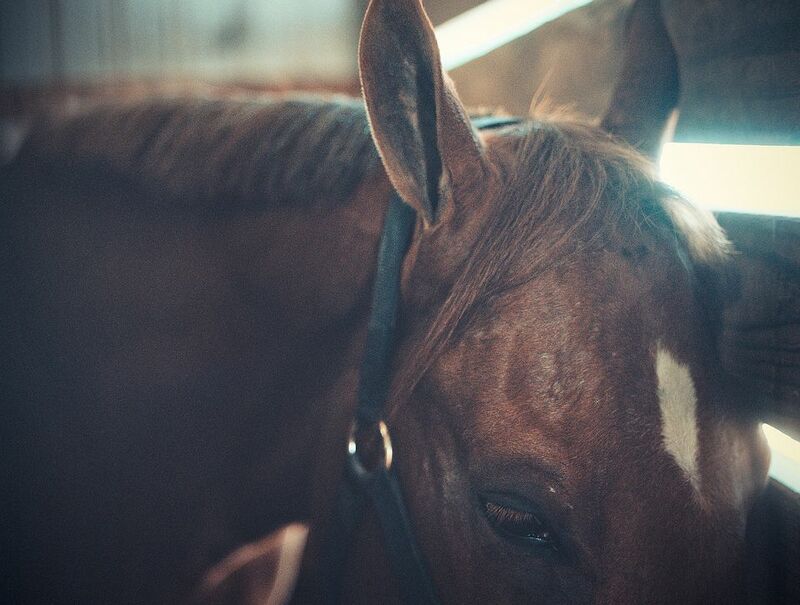 Your veterinarian will examine your horse's eyes to determine which structures within are affected, to distinguish it from a 'simple' eye infection. Besides the obvious symptoms evident in the eye and area, total blindness may follow if the horse is not properly and promptly treated. Most certainly, subsequent flare-ups will cause pain and unfortunately there is nothing that can be done to prevent further episodes when symptoms are not present. Cataracts may develop, causing blindness. Internally, the structures of the eye may become damaged. Because your horse will be experiencing discomfort the symptoms of moon blindness, you'll need to call your vet who will confirm a diagnosis and suggest a course of treatment. Treatment will likely include steroids, and drugs that will help the horse's pupil dilate. You will want to protect your horse from bright light with either a mask or by keeping it indoors. Each time the condition reoccurs, you will need to resume treatment. Unfortunately, if the condition returns too frequently, many horse owners may resort to humane euthanasia rather than let their horses continually go through the pain of the flare-ups. If only one eye is involved the eye can be removed. Surgery to implant a drug-laden disc in the eyes seems to hold some promise, but it is not yet common. Unfortunately, there is little that can be done to prevent moon blindness, mostly because we don't know what will trigger the condition in any particular horse. The best we can do is to provide good nutrition, a clean healthy environment, fly control and watchful care. When you see your horse has an eye infection, call your veterinarian. Eyes are tricky to treat, so you want to make sure if treatment is required, it begins quickly before any major infection sets in.